Nothing too exciting happened on Jan 8 & 9, 2013 due to some pretty heavy rainstorms. Yet New Zealand still managed to make these two days incredible. We left Greymouth around 9:30 am and headed for Franz Josef. When we left there was only light rain, but it got heavier and heavier as we went along. All the cows we saw along the road were huddled together. 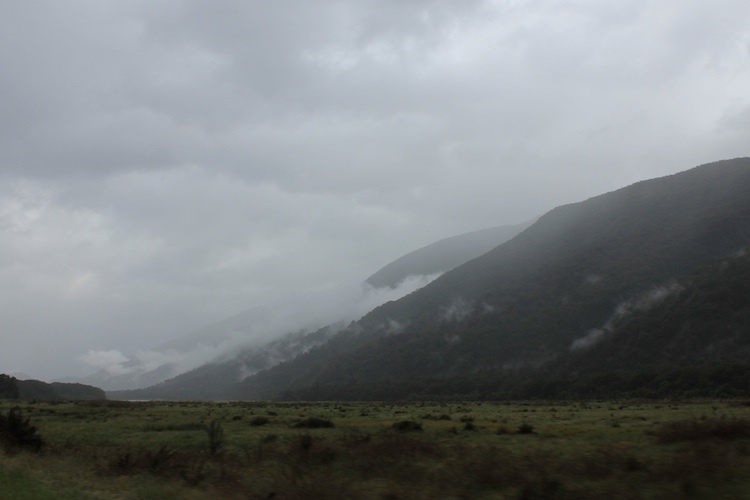 We hoped that the rain would let up, or that it will be nice in Franz Josef as we had a skydive booked for 1 pm. By 12:30 pm, we had arrived at our hostel and confirmed that skydiving was cancelled for the day. We moved our schedule around and booked a skydive in Wanaka for the next day instead. 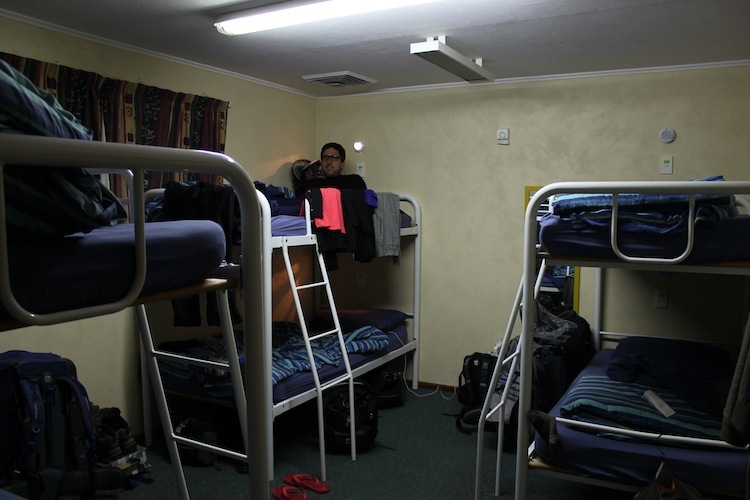 Despite being stuck indoors all day, we were lucky that we were in a YHA hostel that night. It is one of the better hostels we’ve been to, and it appears to be a reputable chain. YHA had plenty of amenities. The kitchen was big and well stocked with equipment. The washrooms were clean and there was a large lounge area. Most importantly of all, there was free unlimited wifi – something very rare in our experience so far. 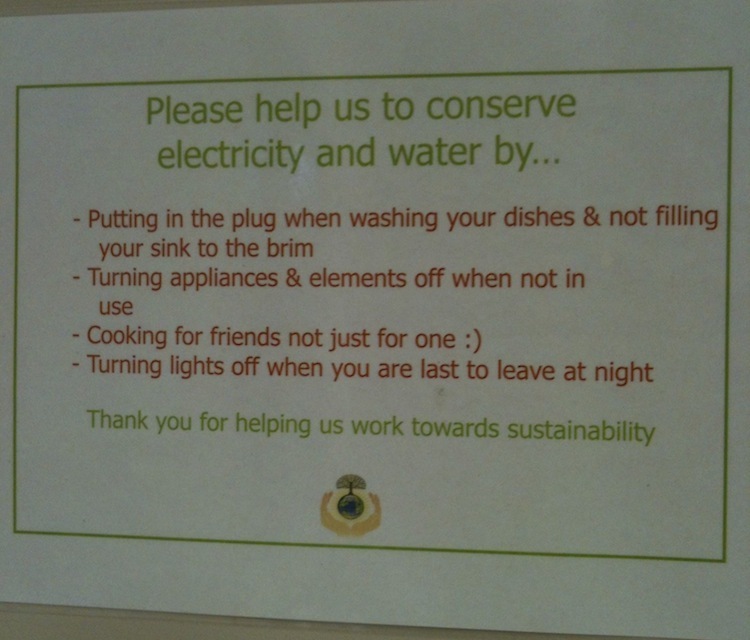 Another thing I really like about YHA is that they’re very environmentally conscious. There are signs everywhere asking you to please recycle, turn lights off when it is not in use, and lots of posters about how our actions affect the environment and how we can do little things to help. I set off to do the first load of laundry since we’ve left, and we caught up on organizing ourselves, blogging, recording our expenses, and catching up with friends in Toronto. The next morning we left bright and early for Wanaka. The rain storm had stopped and we were in high hopes, though all too soon. Heavy downpour started up again. It was very on and off and incredibly unpredictable. We were stuck! There was no other way to get to Wanaka, unless we wanted to go back from where we came, and then all the way around through Arthur’s Pass again. There wasn’t going to be another traffic update until 3:00 pm, and our skydive was booked for 2:00 pm! Needless to say, we had to call and cancel. Turned out it’s pouring in Wanaka too, and all the skydives had been cancelled. 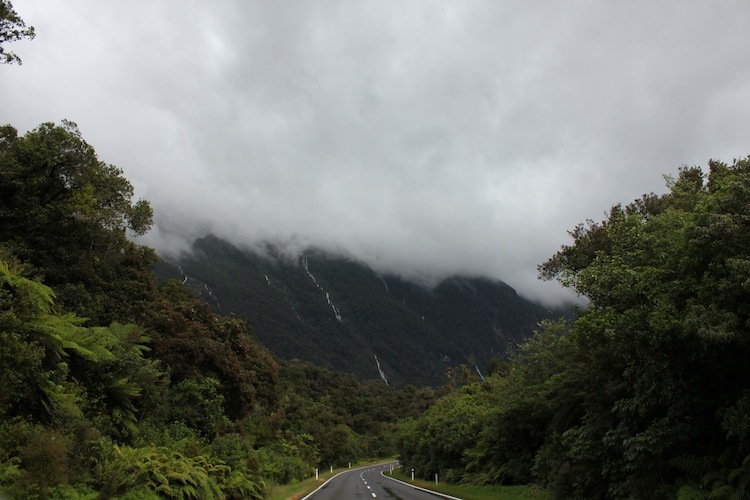 Seeing as how we had absolutely nothing to do, we decided to drive to the Haast Pass anyway to see how far we can get. The road was blocked off by pylons, but we went around them anyway. We eventually got to a road worker who told us that they haven’t seen a rain storm this bad in the last 10-15 years. A bunch of creeks and streams swelled up so much that it had washed a bunch of dirt, rocks and tree branches onto the roads. As we drove further, we could see waterfalls coming down from the neighbouring mountains. The road crew was cleaning up the road one slip at a time from both ends. Unfortunately they didn’t have any method of communication at all so they couldn’t tell how the other side was doing. It continued to rain down hard, but we pushed on and eventually hit a point where the damage was so severe that we had to turn back. We went back to Haast and hung around their iSite Visitor Centre to wait for updates. More and more people showed up, including one large tour bus. Adam and I ended up taking a nap in the car. It was sunny in Haast so it wasn’t all that bad. When we woke up, the iSite Centre was absolutely rammed with people! I went in to check for updates, but decided to stop by the washroom first. When I came out, all the hoards of people made a beeline for the door. 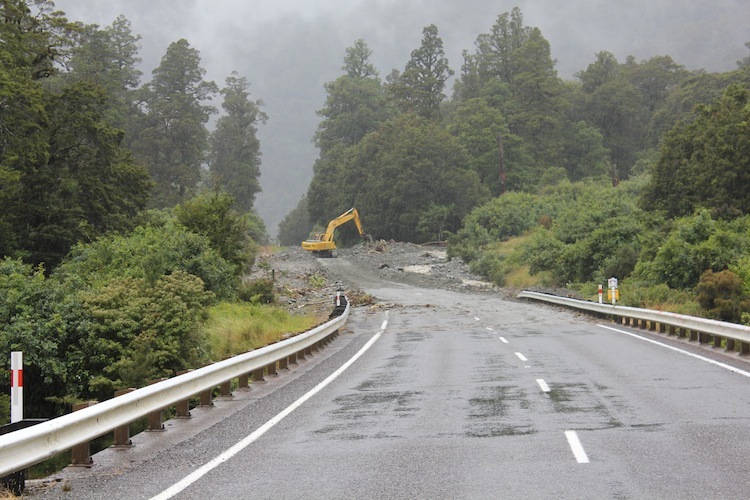 Turned out the Haast Pass was going to be open until 9:00 pm, and then re-open in the morning. As I came out of the visitor centre, Adam had already pulled the car up and was ready to go. Apparently he saw some very amusing widespread panic. People pushed each other out of the way to get to their cars and everyone tried to drive out of the parking lot at the same time. All in a rush to wait in traffic first. We really didn’t know what we were going to go if the pass didn’t open back up before the end of day, but we were ready to spend the night in the car if we had to. We had enough water, cookies and pepperettes to take us through. 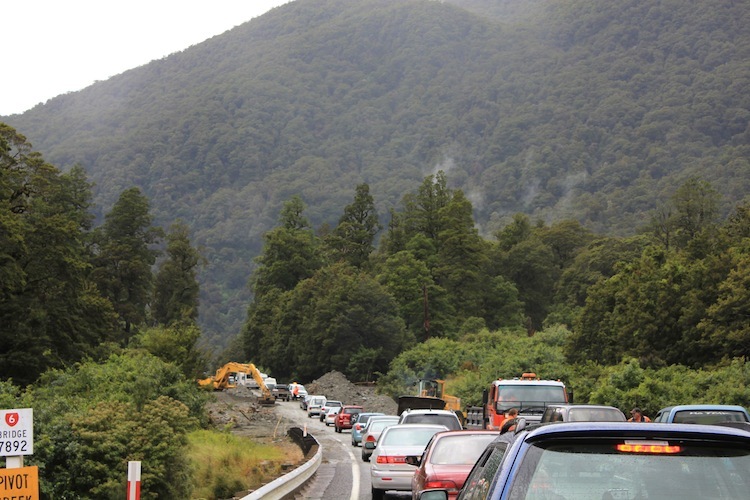 Alas, we made it through the Haast Pass at 5:30 pm. The scenery along the way was incredible. There were mini waterfalls everywhere. All the creeks and streams were roaring with water. The way the clouds floated around the mountains made it look like they were steaming. It was pretty incredible to see such a beautiful rainbow after the heavy storm we drove through. The rest of the way to Wanaka was smooth sailing from that point on. 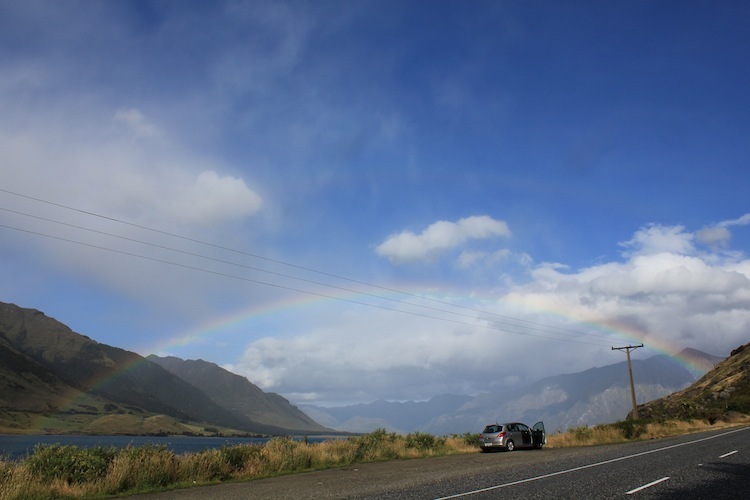 We hit one final snag when we arrived at our hostel in Wanaka. Moving our schedule around involved cutting out our time in Te Anua. 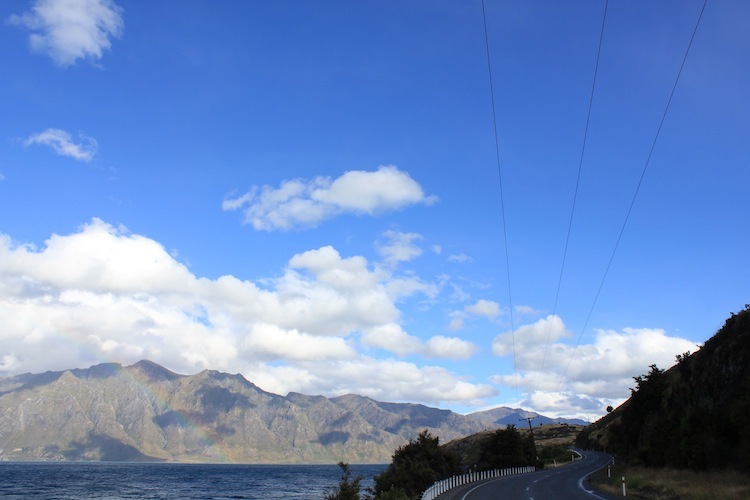 In our original itinerary, Wanaka was not on our list at all. 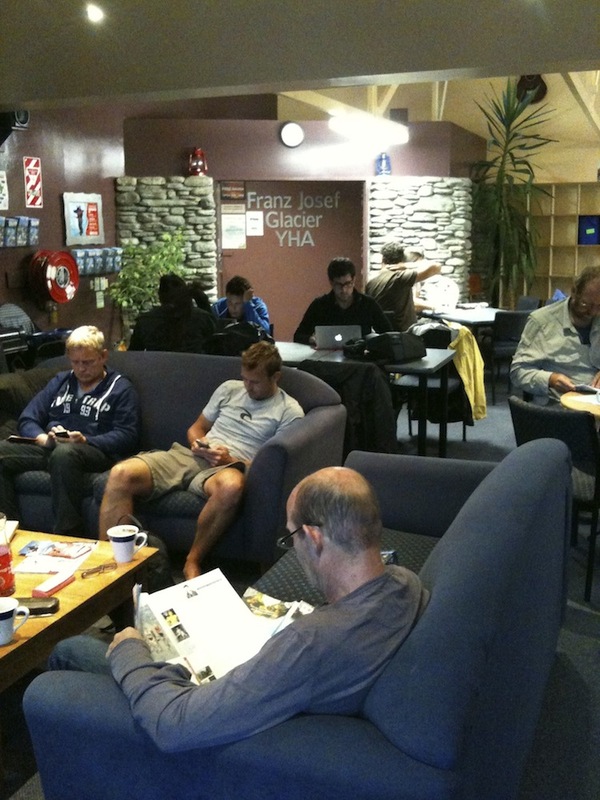 The YHA hostel in Te Anau was most helpful when we called. The rep said he can easily move our reservation from YHA Te Anau to YHA Wanaka, and will send us an email confirmation. Of course, after a failed attempt to email Adam due to a small typo, we were a little surprised to found out that we didn’t have a reservation in the Wanaka YHA. Apparently it wasn’t that easy to move the reservation around after all because we had booked through HostelWorld instead of directly with YHA. The receptionist (Pip) at the Wanaka YHA did her best to call around and find some last minute accommodation for us. Naturally, it was booked solid everywhere, unless we wanted to shell out much more than we would like. 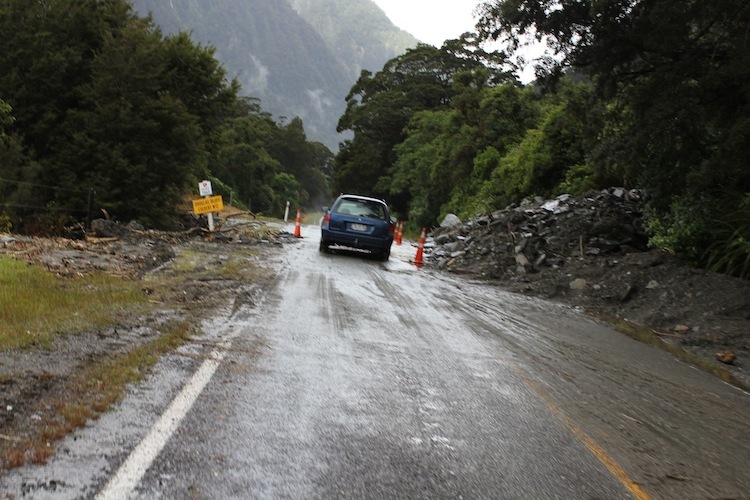 Adam and I were almost ready to spend the night in the car as we had planned if we were going to be stuck in Haast. Luckily after some running around, and checking in with the YHA one last time, they had a last minute cancellation! Two beds in the same room. What more could we ask for? All this happened right before reception closed at 9:00 pm too! I think it’s amazing how everything worked itself out, despite not going according to plan.